Size it up. Coupling the same phenotype-driven system of the traditional Miami J with adjustable sizing, Miami J Advanced enables you to reduce your inventory without sacrificing a precise fit. Best in class. 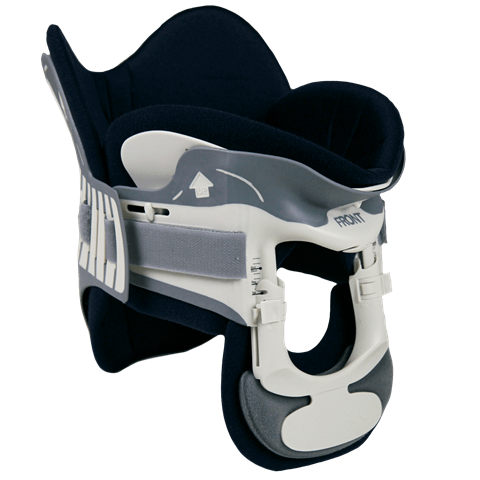 Miami J Advanced is the only adjustable cervical collar that provides the clinically proven superior immobilization you expect from a Miami J product. Avoid breakdown. Miami J Advanced combines soft, overmolded edges and breathable Sorbatex™ II padding (see back panel) to inhibit skin breakdown and the formation of dangerous pressure points. Less is more. Two distinctly-shaped pads — just one each for the front and back of the collar — makes skin care with the Miami J Advanced simple and intuitive. NOTE: This product is recommended for single patient use. Do not reuse on multiple patients. Follow a qualified healthcare provider's instructions regarding usage and infection control.